This year the USPS will celebrate their 100 Year Anniversary for one of their most celebrated programs; the Letters to Santa Claus Program! It’s a wonderful program, and a great, easy way for volunteers like you and I, to help a child in need during the holiday season. Every year 100,000’s of Children write letters to Santa and address them to ‘Santa at the North Pole’. These letters get sorted and opened, and copied. 1 copy saved securely at the USPS, and the other one gets placed in an ‘adopt a letter’ box (after all the Child’s personal information has been blacked out). Volunteers can go into their local post office and ‘adopt’ a letter from a child in need, and help full-fill one of their holiday wishes! 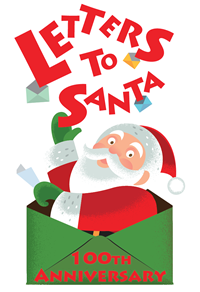 You can read more about the Letters to Santa Program and how to participate on the USPS Site.